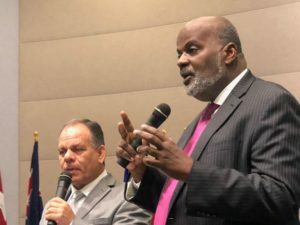 Inter-American Division [IAD] President Pastor Elie Henry shared plans for the Seventh-day Adventist Church in the territory for the next two years during a special meeting with church leaders and staff in Miami, Florida, yesterday. Pastor Henry, who recently returned from visiting four major church regions in Inter-America, officially began as the new IAD president earlier this month. Pastor Henry promised a renewed commitment on his part and that of fellow administrators to the mission of the church in Inter-America, and urged vice presidents, department heads and office staff for greater teamwork in their service to God’s church. He called on leaders to focus on moving forward and doing better. Pastor Henry reaffirmed the need for all church members to be committed to a daily relationship with God and seeking His transformation in the context of Total Member Involvement, a world church initiative to get every member in the church actively working to fulfill the mission of the church.